Dirt used to be the only place for kids to play, before we concreted most of it up. As recent news has shown playing in the dirt and grass actually made kids healthier a lot of parents are tossing their kids back into the yard for some old fashioned fun. That’s where the book I Love Dirt by Jennifer Ward comes in. This is one of my favorite books of ideas for getting kids outside and playing. 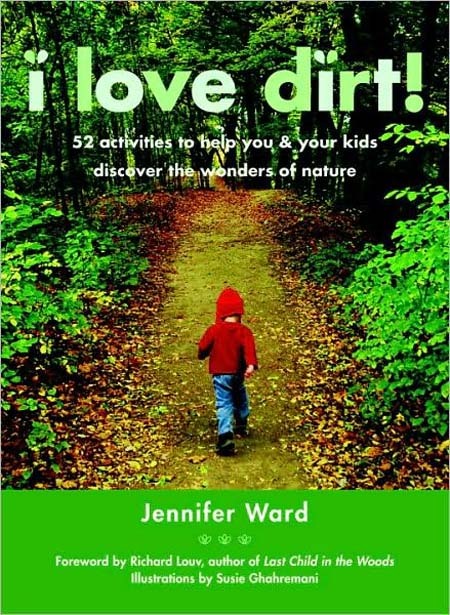 I Love Dirt is more of an activity guide, featuring 52 wonderful ideas for kids ages 3-8 to get out in nature, explore, and even learn something along the way. The various activities span the entire year, covering ideas for spring, summer, autumn, and winter. No matter if your kids are in the middle of a city, out in the suburbs, or already enjoying the country side you will find something worth doing. I love that Ward also included little “Help Me Understand” sidebars for adults to help us explain the science aspects of nature. The forward is written by Richard Louv, the same Richard Louv that wrote the absolute must-read Last Child In The Woods. If he gives this book his thumbs up, you know it has to be good. Unlike most activity books for kids this one really gets kids down and dirty, exploring the little things around them in nature. They will come home with mud caked in their hair, grass stains on their knees, and a thousand excited questions about rocks and trees and bugs. You will be able to see the little nature lovers in them bloom. Ward is a former elementary school teacher and the author of several children’s book. Her experience really shines through in I Love Dirt, you certainly get the feeling her ideas are coming from someone who knows what she is talking about. From simple fun like splashing in puddles after a warm rain to getting a little more educational by breathing into cold air and watching your air puff. These are all easy to do ideas that don’t require much more than a willingness to go outside. But as with most things for children, it is the simplest ideas that make the biggest impact. The only downfall is that I Love Dirt is made for young children. Luckily. Jennifer Ward is already on the ball and has a second book for older children ages 8-12 coming out this July called Let’s Go Outside. If it is anything like I Love Dirt it has to be another winner.